Here is another dessert... Semiya - Vermicelli, a kind of pasta from which we can make upma, payasam, vermicelli bagalabath etc. 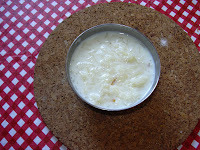 Here is the receipe for semiya payasam. First take a pan, preheat a drop of ghee and fry the semiya(vermicelli) to golden brown. Keep it aside. Now take another pan, pour milk, if you want you can add a cup of water with milk and bring it to boil now add vermicelli to it and cook it in a slow flame for 7 mts. Now add sugar to it. Turn the stove to very low. Since the sugar will release some water, there is no need to add water or milk along with sugar. Stir it every two mts. Add the cardamom and pachakarpooram to it and turn off the stove when the vermicelli is fully cooked. Now payasam is readyIn the ghee pan, roast the cashews to golden brown. Add it to the payasam. If needed, you can also add raisins, we have to roast it along with cashews and add it to the payasam. I personally feel, adding raisins to these type of payasam(where we add sugar) will disturb the taste of milk and sugar. oooooooo... can i have a cup?? ?